See Common Tabs for information on the Location, Comments, Hyperlinks, or Collected Data tabs. Uniquely identifies the equipment item. The program automatically assigns a name, but you can change it, if needed. The name can be up to 16 characters long. For MCCs, the program automatically assigns the names MCC-1, MCC-2, MCC-3, and so on. Base kV The base kV of the MCC. MCC’s are modeled like a bus in many ways. You can connect cables, busways or transformers to it, and perform fault calculations. Spreadsheet View and Configure See Configuring the Spreadsheet View for information about these options. Lock Auto-Sizing When this check box is selected, this item cannot be automatically sized using SmartDesign™ (the auto-design feature). These are the specifications for the MCC including the bus. Service Select the service for the MCC. Your options are 3 Phase-3 Wire or 3 Phase-4 Wire. Unit Select either U.S., Metric, or CSA. These are all user-defined fields. Mfr Use this text field to describe the MCC manufacturer. Type Use this text field to further describe the MCC manufacturer model. Bus SC Rating (kA) The rating of the bus used in calculating the Short Circuit duties for SmartDuty™. Horz Bus Rating (A) The current rating of the horizontal bus. Vert Bus Rating (A) The current rating of the vertical bus. Area numbers are used to uniquely define different areas of the electrical system. These areas can then be used for creating specific text reports from analysis operations that represent subsets of the system. For example, typical paper plant areas may be the power house (Area 1), caustic plant (Area 2), pulp mill (Area 3), and paper machine (Area 4). Area numbers are positive integers between 1 and 999. A zone number is simply a sub-area. This enables even more specific reporting. You may want to define the pulp mill as Area 3 and the digester electrical equipment as Zone 2. Specific reports can then be generated for this combination without including the entire pulp mill or the other digesters. Description Use this text field to describe the particular MCC. Device Code You can type letters or numbers to describe the device code for the equipment item. The information can be converted and printed as a QR code on arc flash labels. Fed By Use this field to indicate the transformer or the power supply source feeding the MCC. Last Updated The date and time the MCC data was last updated is displayed here. Header Comment Use this field for any comment on the MCC. Main Lug Only: No protective device is present. Main Breaker: An LV breaker protects the MCC bus. Select the breaker using Incoming Device Settings. Main Fuse: A fuse protects the MCC bus. Select the fuse using Incoming Device Settings. Incoming Branch Select the incoming branch equipment such as cables, transformers or busways. All the branches connected to the MCC in the one-line are displayed. Incoming Device Settings Opens the data dialog for the main fuse or main breaker specified as the incoming device type. See Low Voltage Breaker Data or Fused Switch Data for more information. This is a spreadsheet listing similar to the Device Library. When you place a new MCC on the one-line, the first time you open its database dialog and click on the Description tab, EasyPower displays the MCC Spreadsheet Creation Wizard which enables you to select the number of rows you want. Clear the check box at the bottom of the Wizard dialog if you don't want it to appear with each new MCC. You can insert or append new rows in the spreadsheet if you need them later. When you click on the Description tab, additional buttons become available on the toolbar. These enable you to perform actions related to the spreadsheet. See Additional MCC and Panel Spreadsheet Options for more information. The list contains all of the same schedules as the Device Library. To enter a listing other than those contained in the list, create a new page in the MCC section of the Device Library. See EasyPower Device Library for more information. Schedule This list enables you to specify which Device Library Schedule your chosen Library Load spreadsheet is located in. To enter a listing other than those contained in the list, create a new page in the MCC section of the Device Library. See EasyPower Device Library for more information. Export The spreadsheets can be exported to metafiles (.WMF) or delimited database text files (.CSV). Export is beside the Print button on the MCC/Panel dialog box toolbar when the viewing the Description tab. Note: The Section Space and Equipment Name are not necessary for calculation purposes but are used to match the way they are organized in the MCC. Section Space Enter the location of the individual bucket in the MCC. Typical entries would be 1A, 1B, 2A, 2B, 2C, and so on. Equipment Name Enables you to identify each piece of equipment. Library Load This list corresponds directly to the Library Load column in the Device Library. After you have made selections in the MCC Library, Schedule and Library Load fields, all of the data cells that follow are automatically filled in when you click on another cell. You can also double-click on the cell to enter something different than what is listed. Status The third column is a toggle "On/Off" to indicate if this particular item is currently connected to the MCC schedule. This affects the power flow and short circuit current contribution. 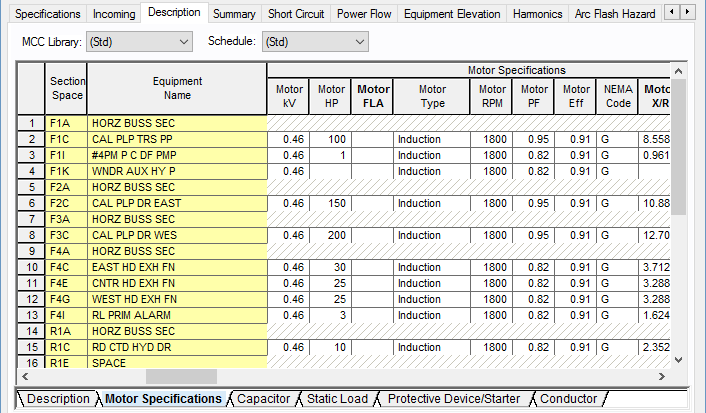 Motor: The motor data required for analysis are usually Motor HP (U.S., CSA) or kW (metric), Motor X/R, and the X/R Ratio in the Short Circuit tab. The required data fields are highlighted in red. If you do not know the motor X/R ratio, you can calculate typical X/R ratio for the motor based on size by selecting the cell for Motor X/R and clicking Calculate in the toolbar or by pressing F9 on the keyboard. A motor contributes to the short circuit current. You can enter other data in the row, such as cable description, protective device, starter description and capacitor data. When you select Motor as a load type, you can plot its curves on the TCC plot. Note: Motor FLA for 3-phase motors is calculated as follows. For U.S. units, the NEC table FLA values are used. For metric units, motor FLA is calculated as Motor kW/(Motor Eff * Motor power factor * Equipment kV * SQRT3). Load: The load data is entered in the columns Static kW and Static kVAR. Other data entries are optional. You cannot plot curves for devices in the TCC plot. VFD (non-regen): Non-regenerative variable frequency drive. The motor data required for analysis are usually Motor HP (U.S., CSA) or kW (metric), Motor X/R, and the X/R Ratio in the Short Circuit tab. The required data fields are highlighted in red. If you do not know the motor X/R ratio, you can calculate typical X/R ratio for the motor based on size by selecting the cell for Motor X/R and clicking Calculate in the toolbar or by pressing F9 on the keyboard. You can enter other data in the row, such as cable description, protective device, starter description and capacitor data. When you select VFD as a load type, you can plot its curves on the TCC plot. Sub-MCC: This means the current MCC is feeding another MCC. You need to specify the sub-MCC ID name and the cable connecting the two MCCs. You also need to enter the protective device data for the sub-MCC. You can plot the protective device curve on a TCC. Sub-Panel: This is similar to a sub-MCC type, except it is used when connecting the MCC to a sub-panel. Motor w/ TCC: The load type is motor. However, you can plot the cable damage curve, protective device trip curve and the motor starting curve on a TCC plot. You need to specify the motor data, protective device data and the cable data. Load w/ TCC: You can plot the curves for cable and protective device on a TCC plot. The load is specified in kW and kVARs. VFD w/ TCC: The load type is motor with a variable frequency drive (VFD). However, you can plot the cable damage curve, protective device trip curve and the motor starting curve on a TCC plot. You need to specify the motor data, protective device data and the cable data. <50 HP Lump: This is to model a group of motors all of which are under 50 HP rating. No TCC plot is obtained for this type of load. >50 HP Lump: This is to model a group of motors all of which are larger than 50 HP rating. No TCC plot is obtained for this type of load. <37 kW Group (metric only): This is to model a group of motors all of which are under a 37 kW rating. No TCC plot is obtained for this type of load. >37 kW Group (metric only): This is to model a group of motors all of which are larger than a 37 kW rating. No TCC plot is obtained for this type of load. The rest of the fields correspond directly to those in the Device Library. See EasyPower Device Library for more information. For information on how to configure the columns that appear in the spreadsheet view, see Configuring the Spreadsheet View. For information on exporting schedules, see Exporting an MCC or Panel Schedule. The spreadsheets can be exported to metafiles (.WMF) and delimited database text files (.CSV). For notes on MCC spreadsheets, see MCC Spreadsheet Notes. The Summary tab of MCC Data dialog box provides the total load on the MCC and the load that must be used in designing. Calculate Downstream Load Calculates the total load on the MCC, taking into account the connected load, demand factors, and NEC code factors. Override with User Values This check box enables you to enter data in the Total Downstream Load – kVA column. The spreadsheet has two sections – MCC Load and Including Downstream Load. This spreadsheet section provides the summary of the loads fed by the feeders of the MCC. The loads from the sub-MCC and sub-panels are not included in this section. Total kVA This is the aggregate load. Total FLA Total load in amps. Motor HP The total HP for the items with "On" in the Status column of the Description section. The total KVA for connected items equal to or greater than 50HP (U.S. units) or 37 kW (metric units). The total KVA for connected items greater than 50HP (U.S. units) or 37 kW (metric units). Variable frequency drive HP (U.S. units) or kW (metric units). Static kVA Total kVA of the loads. Where DF is the individual demand factor of each MCC circuit. Where, kWL = Code Mult Factor * kW for largest motor in MCC. KVARL = Code Mult Factor * kVAR for largest motor in MCC. kW and kVAR are for the rest of the loads. The code multiplying factor is specified in Tools > Options > Equipment. The Design Factor is specified in Tools > Options > Equipment. This provides the sum of the loads fed by feeders inside the MCC and the sub-MCC and sub-panels. kVA Total kVA load calculated. You can enter your own values in these fields by selecting the check box for Override with User Values. FLA Total FLA load calculated. You can enter your own values in these fields by selecting the check box for Override with User Values. Total kVA of the motors which are greater than 50Hp (U.S. units) or 37kW (metric units). X"dv or Xlr Is set at the default value for >50Hp (U.S. units) or 37kW (metric units). You can enter your own value and it applies to all the motors greater than 50Hp or 37kW. X/R Avg Calculate fills this field using values from the spreadsheet. You can enter your own X/R average. Total kVA of the motors which are less than 50Hp (U.S. units) or 37kW (metric units). X"dx or Xlr Is set at the default value for <50Hp (U.S. units) or 37 kW (metric units) but you can change this. You can enter your own value and it applies to all the motors less than 50Hp or 37kW. X/R Avg Calculate fills this field using values from the spreadsheet. You may enter your own X/R average. Calculate Click to calculate the X/R averages for motors greater than and less than 50Hp (U.S units) or 37kW (metric units). 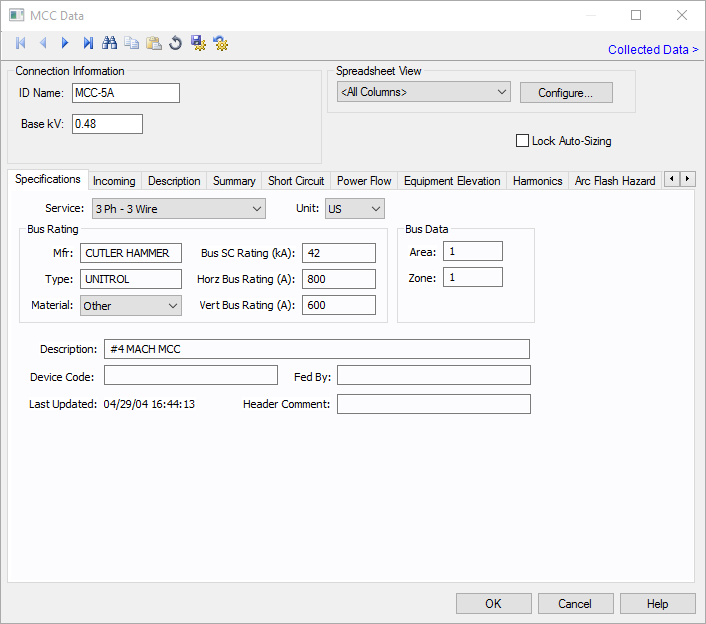 Load Model Enables you to select the motor kVA from the MCC Specifications data or from SCADA (Supervisory Control and Data Acquisition) data. SCADA data can be read in by clicking File > Import. Connected: The kVA is determined by the load defined on the Description tab of the MCC. Demand: The kVA is determined by the demand factor. Demand factor is calculated as the maximum loading conditions divided by the total connected load. This is specified on the Description tab of the MCC. Code: The kVA is determined by the code factors. Code factors are derived from the factors set up in the database File Properties on the Code Factors tab which reference NFPA 70 (NEC) article 220.40. You can view or edit the codes on the Description tab of the MCC. Design: The kVA is determined by the design factor in combination with the code factors. Design factor is set up in Tools > Options on the Equipment tab. You can view or edit the design factor on the Description tab of the MCC. Motors can be modeled for the power flow solution in several different ways. Constant kVA - This is the most common model. It is conservative, and results in slightly lower voltage values than would be measured on an actual system. Constant Current - This model is generally not used in motor modeling. It more closely matches an induction motor's characteristics in the reactive component than other models, but is technically incorrect because kW is relatively constant throughout the voltage range for an induction motor. Constant Impedance - This model is used for starting induction and synchronous machines, and closely matches motor characteristics during low voltages. kW + j Current - This model is a combination of the above models and more closely matches actual motor characteristics within normal operating voltages. Scaling Factor Provides an easy way of adjusting the total motor load used in determining power flows. By changing the scaling factor, the actual Hp (total connected value) entered in the Hp field can remain static. This reduces modeling errors and eliminates multiple databases for different contingencies. SCADA data is derived from real time, or metered data, and converted to an ASCII format which can be read into EasyPower. SCADA data is read in as a 100% scaling factor load. The load value is multiplied by the user-defined scaling factor. This provides a way to adjust SCADA loads to form new cases. kW The kW value as read in from the SCADA ASCII file. kVAR The kVAR value as read in from the SCADA ASCII file. SCADA data can be modeled in the power flow solution in several different ways. SCADA load type is set in the ASCII file, but can be changed by you. Scaling Factor Provides an easy way of adjusting the total SCADA load used in determining power flows. By changing the scaling factor, the actual kW +j kVAR read in from the ASCII file remains static, however the load used in the power flow is adjusted by this factor. See MCC Elevation for information about this tab. Use the Harmonics tab to indicate whether this equipment item is introducing harmonics into your power system. The default is Linear, indicating the equipment does not produce harmonics. Choosing Harmonic makes the item an harmonic source and makes other fields in this tab available to edit. Note: For an adjustable frequency drive (AFD), the Load Type is always Harmonic. For motors, the Load Type is Harmonic if the With Adjustable Frequency Drive (AFD) check box is selected on the Specifications tab of the motor; otherwise, it is always Linear. Equipment Rating sets Fundm Amps to the equipment rating of the item described in the Specifications tab. User Specified activates the Fundm Amps field, enabling you to specify a value. To use fundamental current calculated by power flow, select Calculated from Power Flow in the Summation Fundamental Voltage area of the Harmonics Options > Control dialog box. Use the spreadsheet to enter the harmonic spectrum produced by this item. You can enter up to 30 different harmonics in each equipment item. In the spreadsheet, enter the Harmonic Number (such as 5 for the 5th harmonic), the Harmonic Current in percent of the Fundamental Amps, and the Current Angle. By indicating the current angle, you can simulate transformer phase shift effects on rectifiers so appropriate canceling can take place. The harmonic may be integer or non-integer. Common harmonic spectra may be entered from the device library. For instructions on how to enter your own spectra information, see Harmonics with Spectrum™. 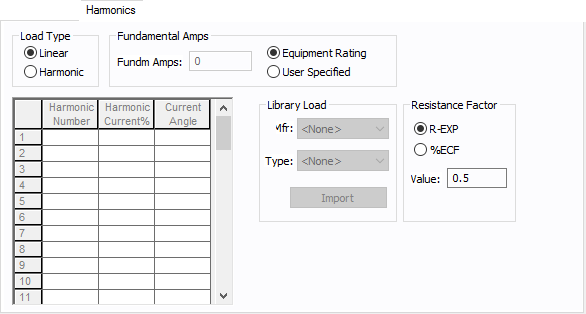 After selecting a particular device library spectrum from the Mfr and Type lists, click Import, and that spectrum is entered into the harmonic spreadsheet. EasyPower defaults all skin effect correction to R-EXP and a value of 0.5. EasyPower calculates arc flash risk assessment results using the options set on the Arc Flash Hazard tab. The results are calculated for automatic transfer switches, buses, tool points of connection, MCCs, and panels. You can specify how you would like arc flash results determined for this bus using AF for this Bus. Calculated: When the bus is faulted, EasyPower the performs arc flash hazard analysis using the calculation method specified in Short Circuit Options. EasyPower uses other settings on this tab as part of the calculations. Excluded: Select to exclude the bus from arc flash reports. An example of when you might select this option is for a bus that is required to model the electrical parameters of the system but does not actually represent a piece of electrical equipment. Other applications include nodes and tap-offs (junctions), where energized work is not required. Forced To: When you select this option, you can enter the incident energy and arc flash boundary for this bus. The incident energy and arc flash boundary values are shown on the one-line and in reports and work permits. This can be used for instances where you need to apply a calculation that is outside the scope of the industry standard calculations. <<Use Global Option>>: Use the option specified in Short Circuit Options. Including Main: Always display the arc flash hazard results on the load side of the Main protective device for this bus equipment regardless of what options are selected in the Short Circuit Options. Excluding Main: Always display the arc flash hazard results on the line side of the Main protective device for this bus equipment regardless of what options are selected in the Short Circuit Options. Both (Incl & Excl Main): Always display the arc flash hazard results on both the line side and the load side of the Main protective device for this bus equipment regardless of what options are selected in the Short Circuit Options. Pre-defined Fixed Times: Obtains arc clearing time for the bus from the library default values. This is not the same as the trip times calculated form the TCC curves of the upstream trip device. The values stored in the library are simply predefined approximate trip times. This is a legacy method and is not recommended. User-defined Times: With this option you can specify the protective device clearing time for each bus. The details of arcing time for the bus can be specified in the fields Device ID, Relay Function and Time (s). When this option is selected, a time must be specified. TCC Times (Automatically Calculated): Arc flash incident energy are calculated based on time characteristic current curves specified in each protective device data dialog box. The trip clearing time of the equipment where the device is a relay controlled breaker is the sum of the breaker mechanism opening time (for example, 3, 5, or 8 cycle), the relay trip time, and any time entered into the Relay Data, System, and Aux Time data fields. User-defined and TCC Times: Provides results for both user-defined times and TCC times as described above. User-defined One-line Device: With this option, you can specify which device you want to use for the TCC time, and the program will obtain the trip time automatically. You can select a device type (relay fuse, or low voltage breaker) and device ID. If you select a relay, you also select the relay function. You can specify the working distances shown on the one-line and in reports and work permits. Default from Options: When selected, the program uses the workings distances from the Default Working Distances spreadsheet in the Arc Flash Hazard Options. User Specified: Selecting this option enables you to enter the working distance for this item. The units displayed are based on the units selected in Arc Flash Hazard Options on the System tab. For inches, the range is 1-1000. For meters, the range is 0.1 to 1000. You can specify the electrode gap shown on the one-line and in reports and work permits. Default from Library: When selected, the program uses the electrode gap from the device library. User Specified: Selecting this option enables you to enter the electrode gap for this item. The range is between 0.1 and 25,000 mm. You can specify the electrode configuration shown on the one-line and in reports and work permits. Default from Library: When selected, the program uses the electrode configuration from the device library. User Specified: Selecting this option enables you to select the electrode configuration for this item. The options available are based on the orientation of the electrodes, whether they are inside an enclosure, and in one instance, whether they terminate into a barrier. VCB: Vertical electrodes inside an enclosure. VCBB: Vertical electrodes terminating in an insulating barrier inside an enclosure. HCB: Horizontal electrodes inside an enclosure. VOA: Vertical electrodes in open air. HOA: Horizontal electrodes in open air. You can select more than one configuration to represent the multiple types of conditions that can occur for the equipment. EasyPower evaluates each configuration and then provides values for the highest incident energy based on the existing electrode configurations. Annex C in the IEEE 1584-2018 standard describes examples where you might use more than one electrode configuration. Tip: To change the electrode configuration for multiple items on the one-line, select the items in the Database Edit focus and then on the Home tab, click Change > AF Bus Electrode Configuration. Electrode configurations are only applicable to the IEEE 1584-2018 standard. For more information, see Electrode Configuration. You can specify the enclosure size shown on the one-line and in reports and work permits. Default from Library: When selected, the program uses the enclosure size from the device library. The library provides typical values based on the equipment type and voltage. User Specified: Selecting this option enables you to enter the enclosure size for the item. This enables you to get more accurate calculation results, assuming the correct dimensions are entered. The units displayed are based on the units selected in Arc Flash Hazard Options on the System tab. For inches, the range is .01-1000. For millimeters, the range is 0.1 to 25,000. Enter the number of labels you want to print for arc flash hazard analysis. If you enter "0," no labels will print. You can type a comment that appears on the arc flash label when it is printed. For example, you could type a location description for the equipment to assist with label placement. 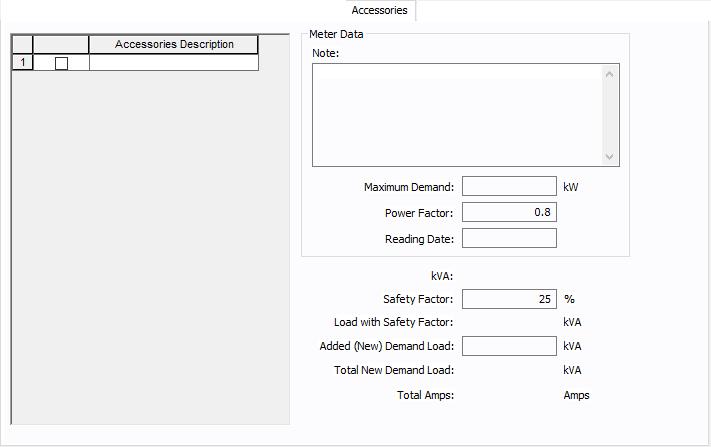 Accessories Description The accessories for distribution equipment types can be specified in the panel, MCC, and bus dialog boxes. You can add or delete the accessory items as needed per equipment. Only the selected items are displayed in the schedule outputs. Note An accessory note of up to 1,024 characters. Maximum Demand The maximum demand load at this equipment. Power Factor The power factor for the equipment. Reading Date The date the meter was read or the information was gathered. Safety Factor Percentage above the kVA that will be multiplied to calculate the new safety factor load. Load with Safety Factor Load amount after calculating the safety factor. Added (New) Demand Load User-specified load amount to add to the equipment. Total New Demand Load Total of the load with safety factor and the added demand load. Total Amps Amps based on the total demand load. Copyright © 2019 EasyPower LLC. All Rights Reserved.